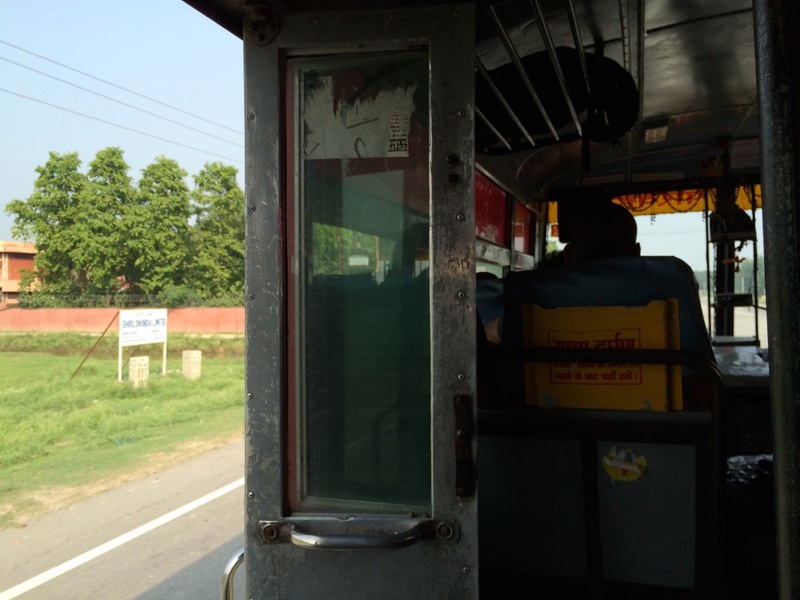 When we, Chris, Fabien, Madhav and I arrived at the Ambala Cantt bus stand we were informed by a conductor that there are no Volvo buses to Delhi at that time. However, he advised us to take a taxi that would charge comparable to the buses. When enquiring at the taxi stand, we were surprised that the taxi ply at almost same rate as an ordinary bus. Rs 250 per person on a 7 seater. The taxi owner suggested that we book the entire taxi for Rs 1600, so that we did not have to wait for the car to be full and be comfortable. That too worked out cheaper than a Volvo. So we setoff on an AC taxi towards Delhi. Our driver Naresh was on a month long vacation. 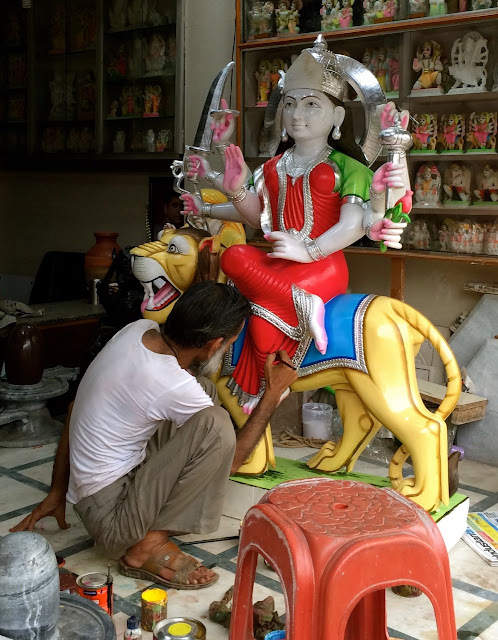 He was working in a restaurant in Malaysia and hailed from Agra. Bored during his vacation, he had decided to drive his friend's taxi for a while that would give him a chance to travel a little and see places. He spoke a lot about his life there and his visits to Singapore and Indonesia. After a 3 hour long journey, we reached Delhi at around 5 PM. We took metro to NDLS station. Zostel is about a kilometre and half from here on Qutab road. 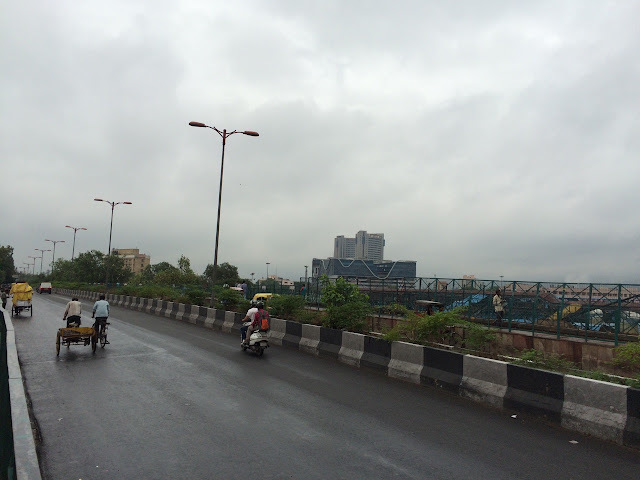 If you walk you may want to climb down the flyover to reach Qutab road. 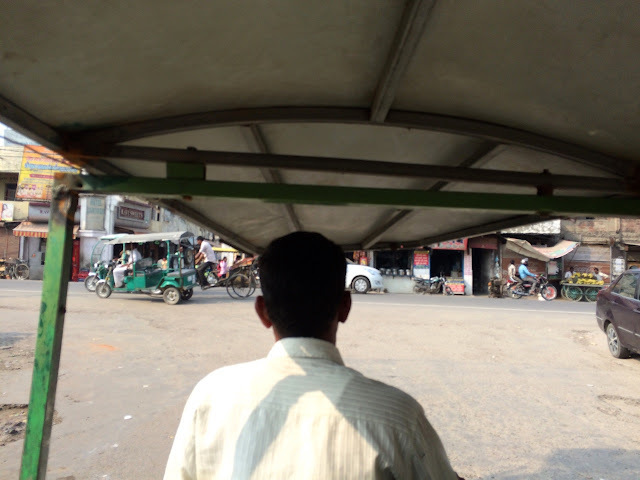 However, we took a tuk tuk. 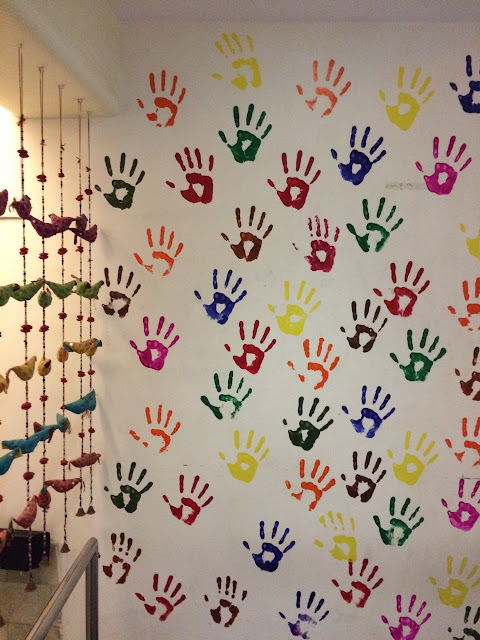 Zostel, Delhi has a very nice ambience. It is specially designed for backpackers. They several good dorms and also nice private rooms as well. 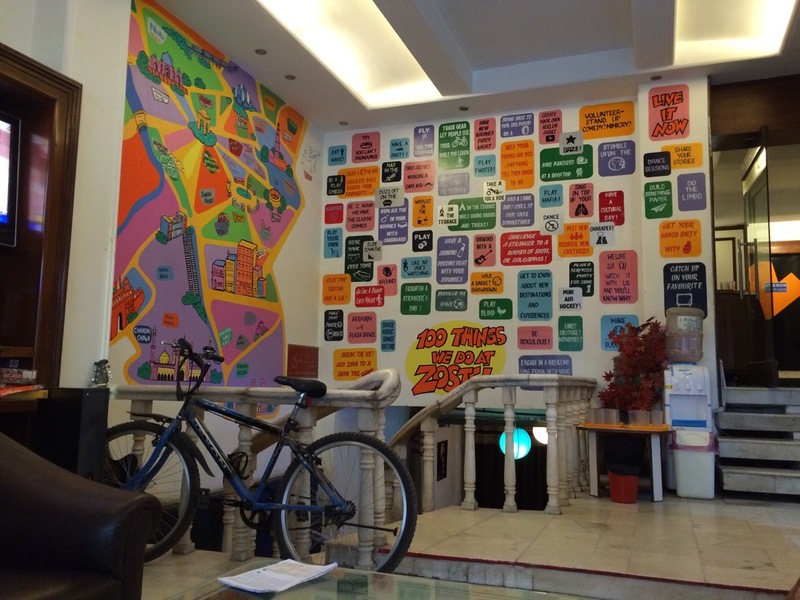 The place was filled with backpackers from around the world. We were allocated a dorm for 8 which seemed very clean and hygienic. We had charging points for each bed, a safety box to keep luggage. We threw our bags and took off to Connaught place. 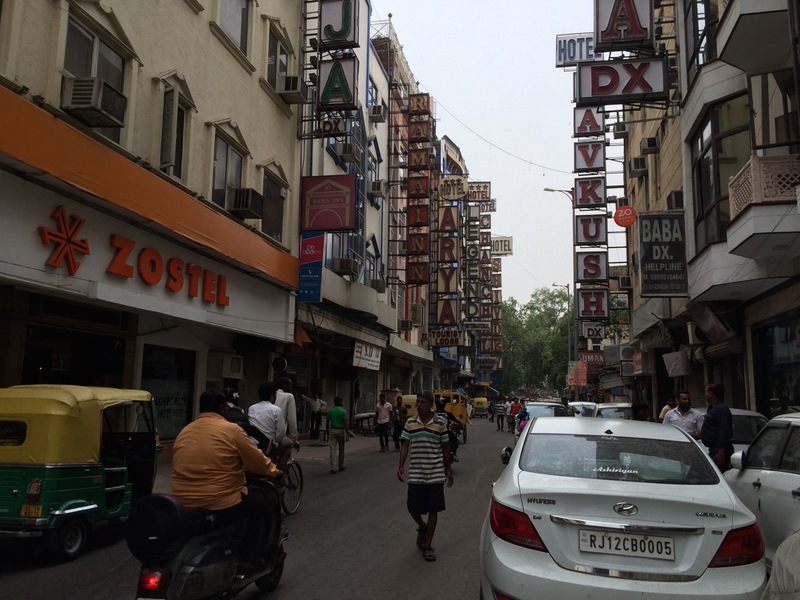 This is kind of a central location in New Delhi which is filled with restaurants, boutiques and shops. I liked this place as it seemed very lively. We headed to the Monkey bar and settled in with a pitcher. Their Nacho pyramid and burger are mouth watering. I had been to the one in Bangalore but I must admit that the ambience and food was much better in the Delhi one. We talked for a while on various topics but at 10 we all were dead tired due to series of long days. We took the metro back to Zostel and almost immediately crashed to bed. Well, I had a very good sleep until a cellphone played loud music in our dorm. People alerted the owner but he seemed to be in a deep sleep. We woke up and tried to wake him up and asked him to switch off the music. He seemed unconscious. Fabian got very pissed and someone even used a F word. Finally the music stopped. That guy perhaps was totally drunk. He did not wake up until we left next day. Apart from that, it was an uneventful sleep that was much needed. Next morning, I woke up early as usual and took a walk around the street and captured some mundane moments of the locality. I had tea at a local tea stall. Had my breakfast served at Zostel and then woke up Chris and Fabien as we had to vacate the room by 10 AM. We left our bags at the luggage counter and headed towards the Metro station. We did not have much time so we decided to go to just one place. 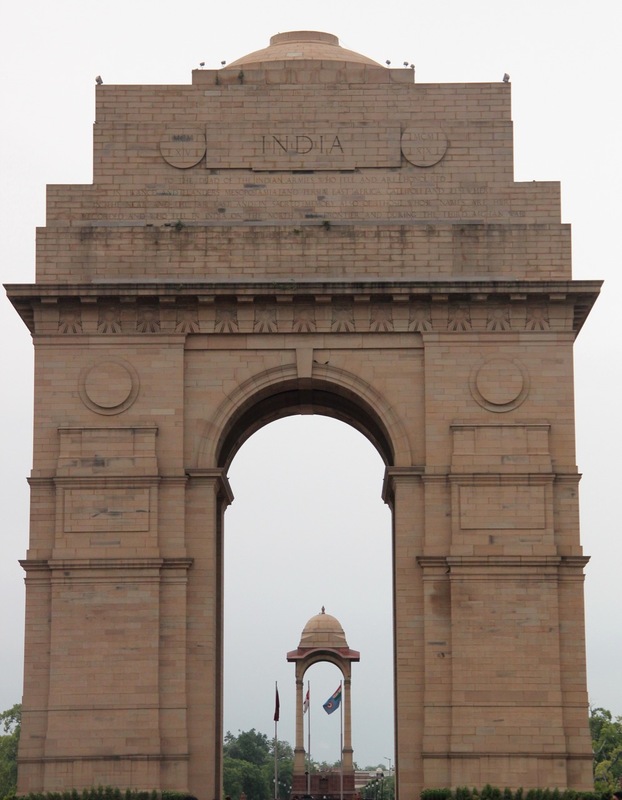 We zeroed in on India gate, took some directions from the lady at the counter and headed to the station. This time we walked to the station and its not very far after all. The early morning showers had made the weather bearable. But the walk also revealed to me how dirty the surroundings were in this part of the city. We took metro to some stop directed by the lady at Zostel counter but turns out that it was not the best place to reach India gate. So we decided to take an auto. Auto driver told we could also see Purana kila (Old fort). So we reached there only to find out that the entry fee difference for Indians and Foreigners was 10 times. My french friends thought that it was not fair. I kind of agreed as it made no sense to charge the tourists on every such attraction. A nominal amount could be charged for the visa and I think it should cover all of it. But here the difference was as big as 10 times in just one such tourist attraction. 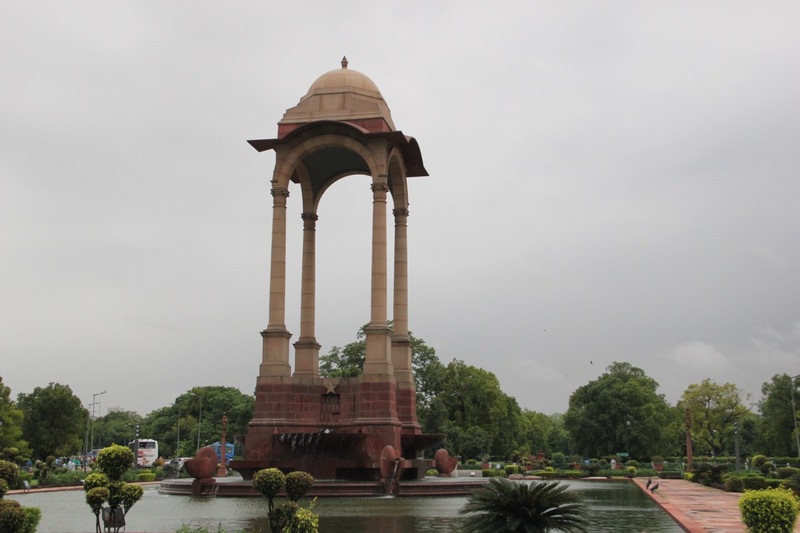 We decided to walk to India gate instead which wasn’t very far off from the old fort. Apparently, this part of Delhi is very clean with wide roads and trees by the sides. 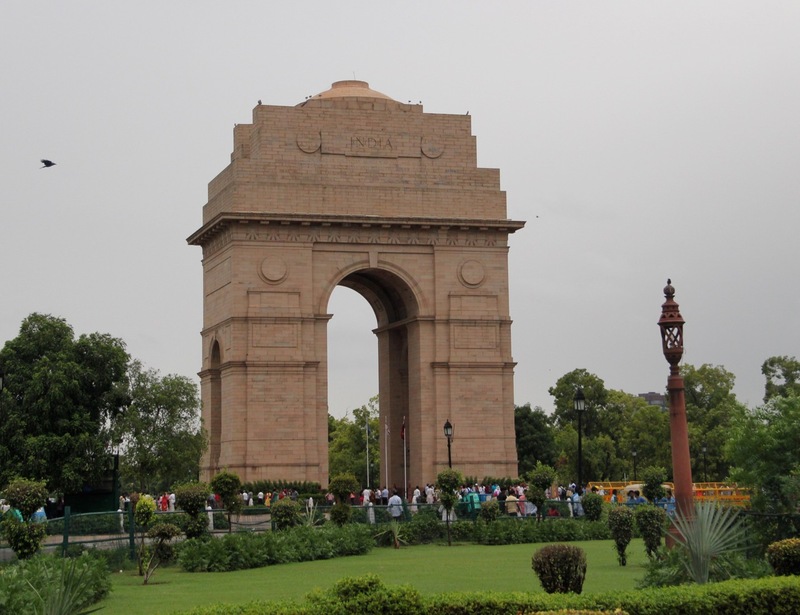 India gate was decently crowded. We took some pictures. On the other end of the road is the Rastrapati bhavan. 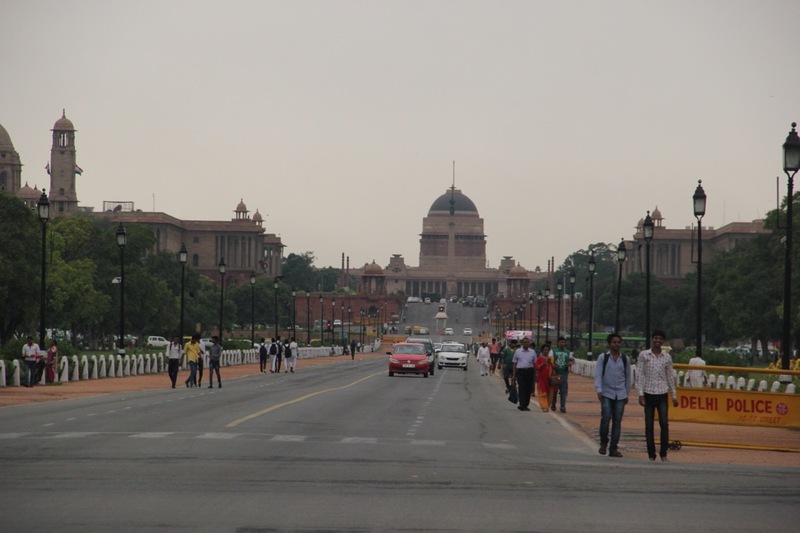 We then walked towards Rastrapati bhavan (President’s hall) but the walk seemed to be very long. So midway we took an auto and decided to head to Connaught place which all three seems to consider our favourite place. 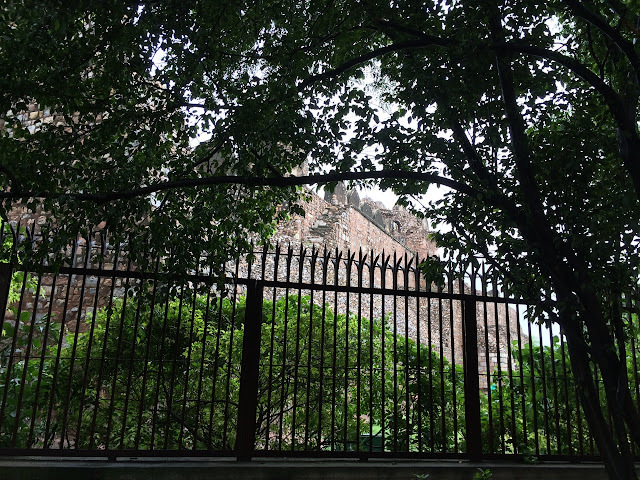 Earlier, we had heard so much about this place called Hauz Khaas. Apparently it is a very happening place in Delhi now filled with nice café, bars and shops that play live music. However, due to lack of time, we decided to skip it. We settled in at a coffee day and chatted for a while about general topics until it was time for me to say good bye to Fabien and Chris and head back to Zostel. I returned back to collect my bags and headed to the airport on airport express. I had to get off at Aero city and take a shuttle bus to Terminal 3. I was on time to check in my bags. I was offered a business class for an extra 1000 rupees. Since my tickets had come free from my credit card points, I decided to take it. I had a very brief encounter with our capital but it surely gave me a warm feeling. Except for the weather and some unclean areas I think that I enjoyed most of my stay there. I will return to Delhi to explore more but definitely not during this season. The wedding celebrations starts two days before the main ceremony with Sangeeth. The same evening (July3rd), several women gathered in the living room to turn this event lively with some traditional songs. 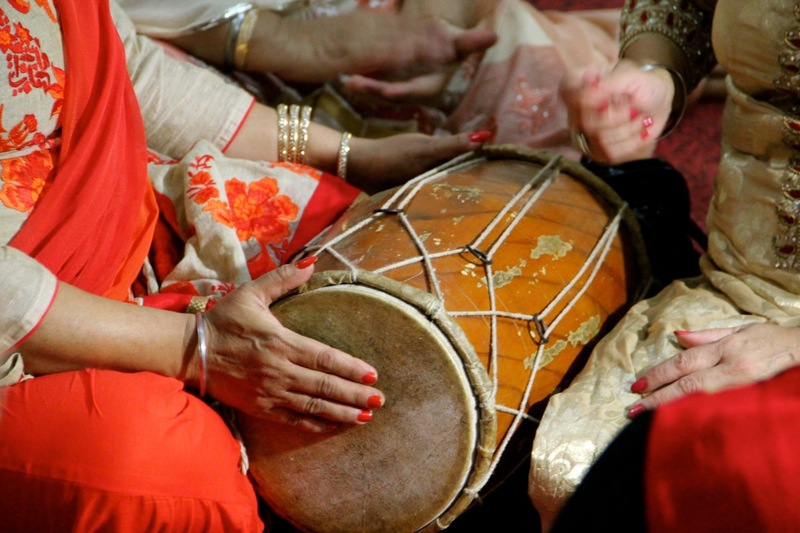 The youngsters played music and entire family danced to the Bangra music. It was a very lively atmosphere. 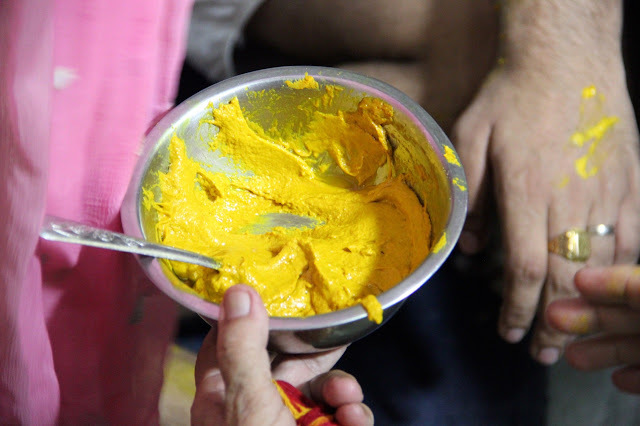 After that, there was this ritual, where in the women apply turmeric to the bridegroom. 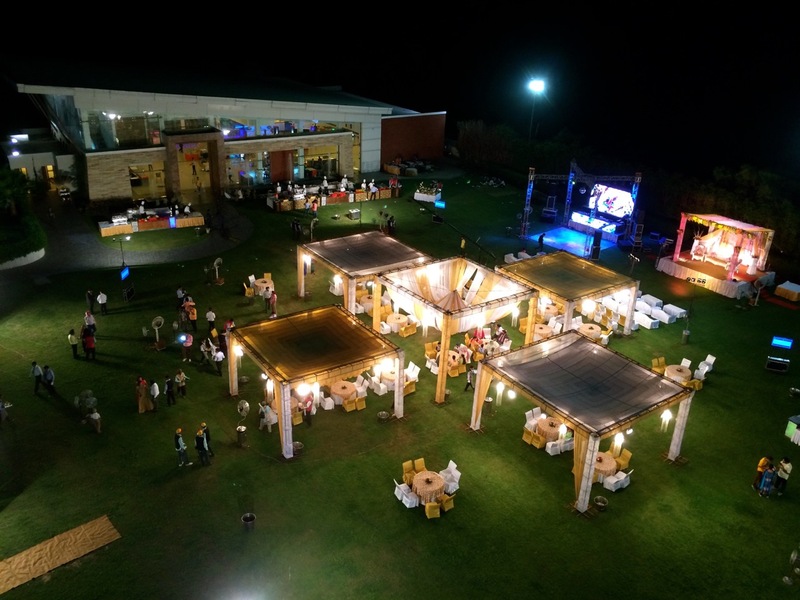 Snacks were arranged in the terrace for all the guests. Some tasty local chats were brought in. Next, the boy leaves the house and goes to his uncles house refusing to marry the girl unless his father settles to a renumeration demanded. Well Aman was hoping lakhs but I think he could not negotiate beyond a couple of thousands. 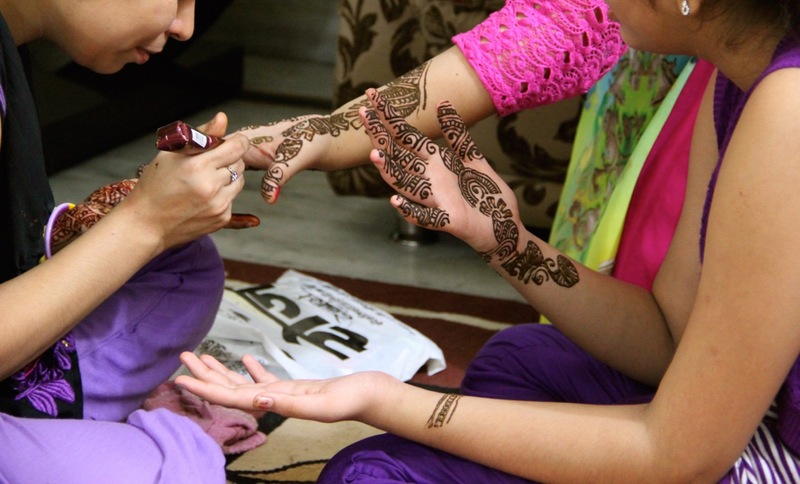 Meanwhile, at home, the sisters of the bridegroom got Mehendi done to their hands. All through the evening, I had a very entertaining company of Aman’s little cousin Harshit, a eleventh grader. His lively nature, enthusiasm and witty talks made time fly by. After a tiring day, I retired to bed at around midnight. Next day, we were up and ready by 7:00 AM. Aman’s uncle took me to the nearby Gurudwara where I observed and repeated his mannerisms. A lady was singing verses from the holy book. I sat there for a while amongst others observing the little details of this place of worship. A bus was arranged to Ambala, to the brides place which was a 6 hours drive. I don’t think I have to mention that it was an AC bus. Aman’s cousin, Sheena, Harshit and I occupied the last seat and conversed a lot. Sheen’s brother Lucky joined midway and we had some great fun moments with lots of inside jokes. The best one was we teased Harshit for tagging every Facebook photo with 39 others. So it became a joke amongst us and we would end every sentence with « 39 others ». The bus would stop at right places for breakfast and lunch. We had very tasty Samosas for breakfast and a good Punjabi meal for lunch. It is interesting to see how tasty the food is generally here in any place. 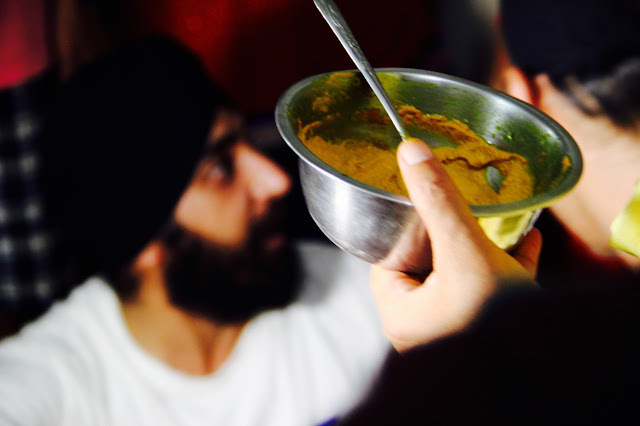 The dhabas have amazing food. Post lunch, the bus got lively with Antakshari. Lot of singing and shouting followed. It suddenly turned the journey into a celebration. It is interesting to notice that how Antakshari is so much a part of Indian culture irrespective of where we come from. In Mangalore, I can’t think of any travel with an extended family that would have happened without an Antakshari. It always sets the mood right. We reached Ambala Cantt at around 5PM after several U-turns and of course a stop for tea. When I asked Lucky why we were stopping, he replied - « Hum punjabi hein humara pet kabuki nahi barta. » (we are punjabis, our stomachs never gets full.) that was hilarious! Some home made snacks were also served by a co-traveler. We were put up at the Country wood hotel outside of Ambala cantt. I shared my room with Aman’s friend Madhav from Delhi. It was great talking to him. Madhav and Aman both are into music and I enjoyed my conversation with him. By 8 PM we got ready. We walked down to grab some food. The setting was exuberant. The engagement stage was well decorated and there was food in every corner of the ground. You name the cuisine and it was there. 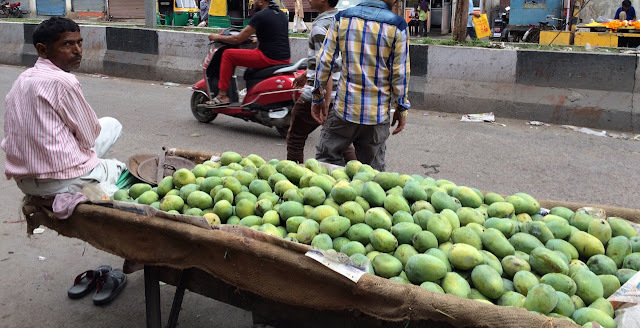 We tried some local Delhi chats. Everything was delicious. Food is always a very crucial part of an Indian wedding and no matter which part of India you come from, a special attention to variety of food is given. The Baarat (Bridegrooms wedding procession) was to start at 8:30 PM but it only began at 11:30 PM. Madhav and I could not stand the heat so we returned to the room to relax in an AC environment Two friends of Aman, Chris and Fabien had arrived from France and they wanted to tie pagdi (Turban) like Sardars. 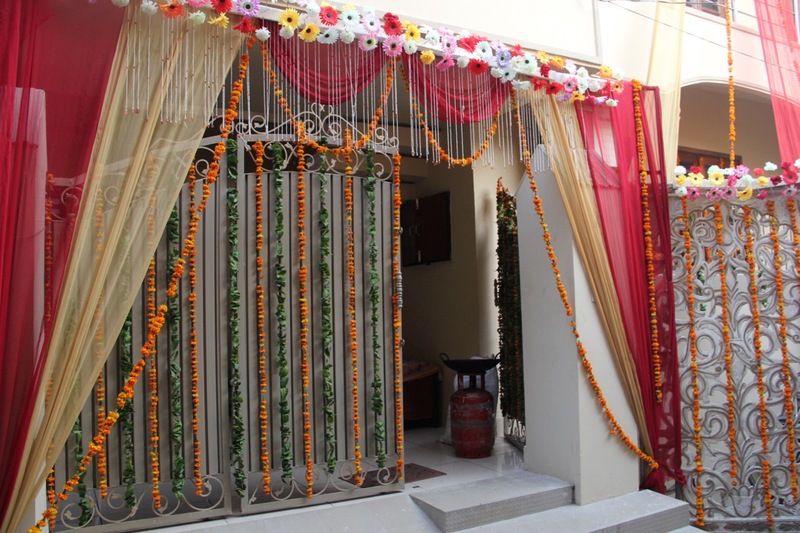 Aman had arranged for that and they flaunted their new look at the engagement. 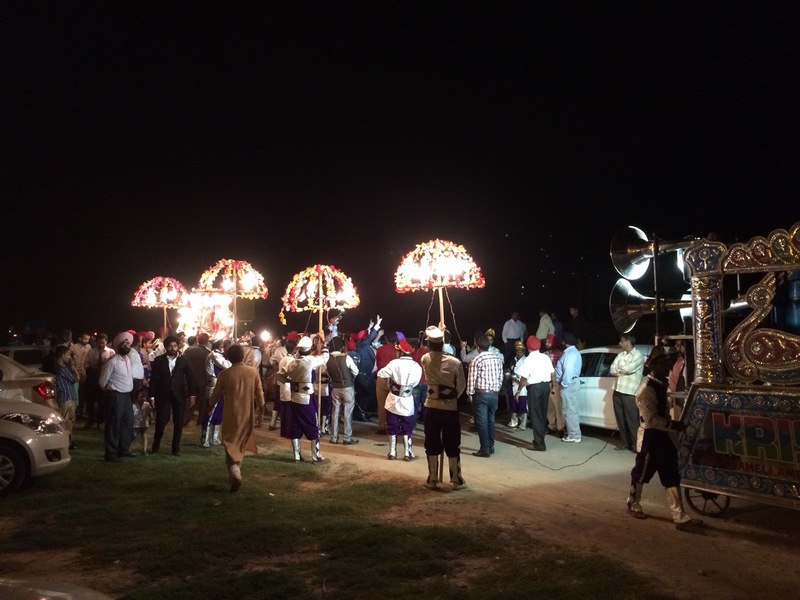 The Baarat was lot of fun with friends and relatives of Aman dancing in front of the chariot he was riding in. He looked fantastic in his ethnic wear. Madhav and I started off the selfie mania there too. After the boy arrived at the entrance, the girl family came and greeted everyone. Her uncle hugged his uncle and offered each other some gifts. The same repeated with all other relatives. 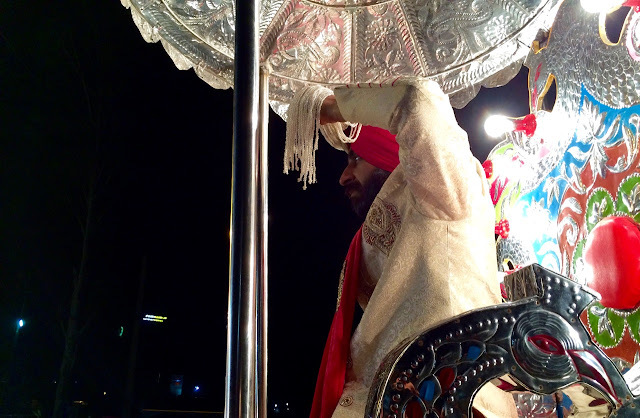 Aman’s friend Simran’s dad explained to us that actually a Sikh wedding is very simple. There is a prayer in front of their holy book and that is all. But then how we prefer to celebrate the occasion depends on us. I think that is true in any wedding. The rituals are normally simple but we want to turn this moment into something special because it is the moment to reunite and celebrate our togetherness. After that was done, the bride’s sisters blocked the grooms way. They demanded a hefty amount to let him pass. A negotion between the girls and the boys from the grooms side followed and finally a sum was agreed upon. The girl arrived in a chariot decorated with Peacock feathers and a pre-wedding shoot was displayed on big screen. Madhav and I finished some quick dinner at midnight. The choice of cuisine varied from Indian to Chinese to Italian. We wished Aman and his fiancée and decided to head back to room and crash. After a small chat about n’importe quoi, I retired to bed at around 1 AM. Next day was the wedding. We were up and ready by 10:00 AM. That was what we were told and considering the rituals in the south, that had to happen at the right time of the day, I expected less delay on the day of the wedding. But, here things are different. By the time everyone was ready, it was 12:00 PM. Till then, Madhav, Fabien, Chris and I chatted. Fabian and Chris also had no plans for the day so we three decided to head to Delhi after the wedding. 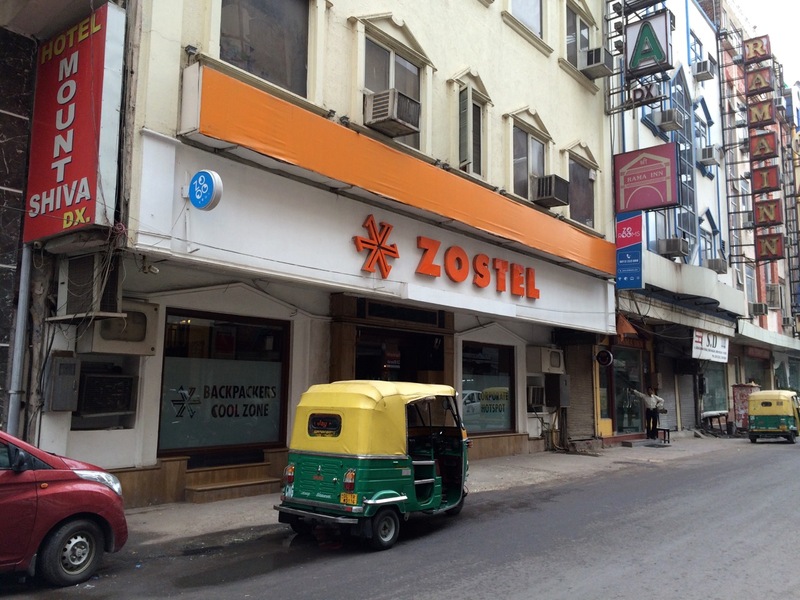 Madhav suggested we stay at a hostel called Zostel. We made our free reservations online. While we waited for others, Harshit and I took some crazy, funny selfies. The wedding in Gurudwara was simple with the priest reading verses from the holy book and some prayers. The boy and girl walk around the holy book to complete the ritual. After the wedding, lunch was served there. Again, lots of food. We changed and decided to head to Delhi soon after lunch. Before leaving, we took some selfies with the couple. I am growing extremely fond of group selfies. They always appear to be happy and natural. Perhaps, it is because everyone unitedly is in the same moment. My selfie stick is the best purchase I have made in recent times as it helps me bring people together into a moment that seems to be perfect only with togetherness. And what a wonderful wedding this was! 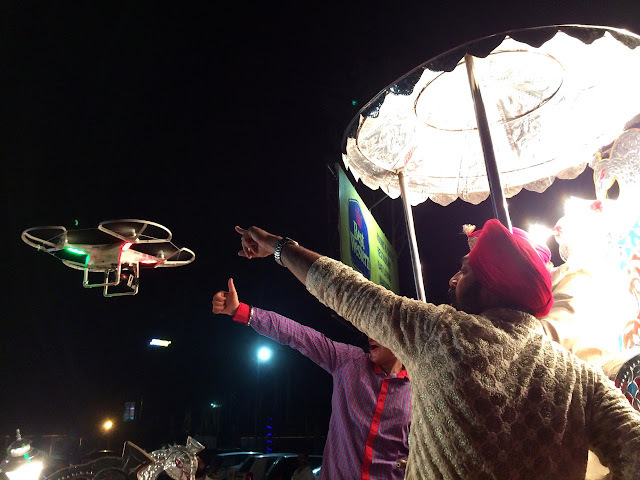 My friend Aman had invited me well in advance for his wedding as it involved a long journey and flight reservations. When other friends, one by one dropped off, I was unsure of this trip. But, Aman insisted me to come and assured me that it would be a great experience. Today, after having returned I couldn't agree more. So on the 3rd of July, due to a pre-ponned flight, I landed in Delhi at around 8:30 AM. Aman had asked me to book a train to Rampur, UP. 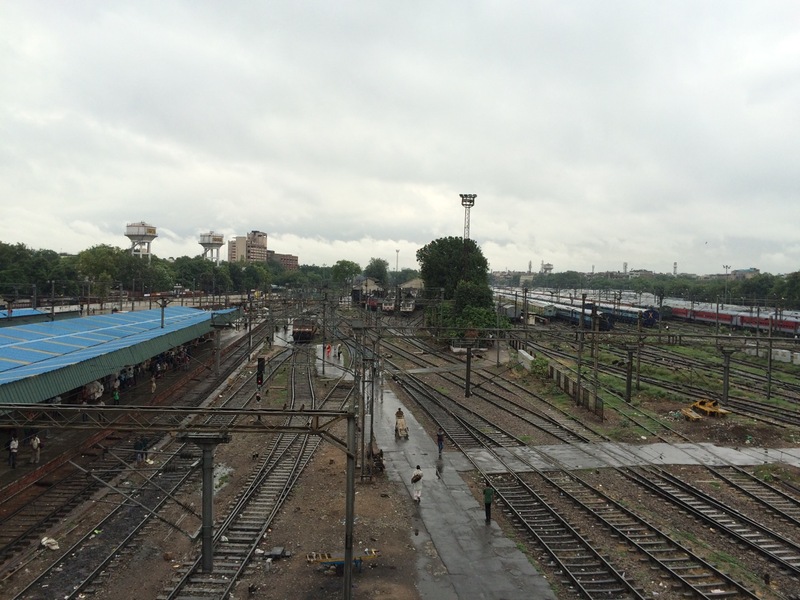 I had waiting list on two different trains that were to be boarded at two different railway stations - DEL and NDLS. Interestingly, both got confirmed and I took the one in the morning from NDLS. At the airport, I was directed to take a shuttle to the nearest Metro station called Aerocity. 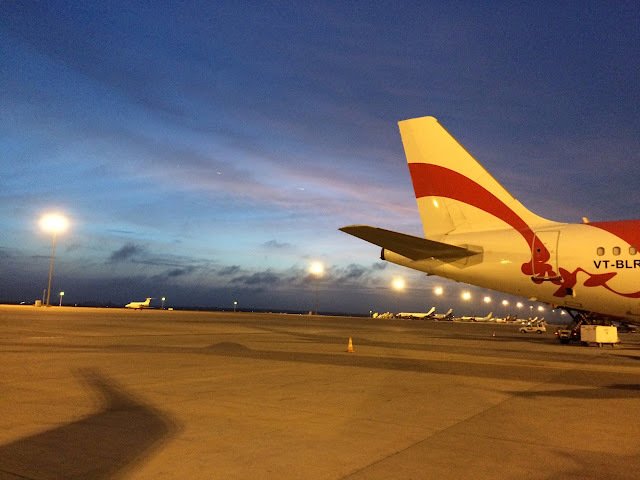 For most domestic flights departing from or arriving at Terminal 1 this is the way to get to the nearest Metro station. Terminal 3 has a metro station there. So the bus was quick and I was charged a nominal Rs30. The first thing I noticed when I drove off from the airport is that everything seemed to happen in a very relaxed and lethargic pace. In Bangalore, there is always an unnecessary rush in people to get somewhere but here even vehicles seemed to move in a lazy fashion as if there was all the time in the world. It was actually a comforting sight for a traveler like me. Well, I got off at Aerocity metro station and was directed to take the airport express directly to the last stop - NDLS railway station. Delhi Metro is designed very similar to that I had witnessed in Hong Kong. Again, it was a very relaxed journey. In days to come, I did travel in Metro; sometimes they were crowded but I never felt it was over crowded like I did experience in Mumbai trains. Anyways, I got off at NDLS and crossed the road to get to the railway station. Kashi express was at 11:30 AM and I had more than an hour, so I decided to grab some quick brunch at a local restaurant. Then, I waited for my train at the platform. That is when, I felt the heat. The airport, metro stations, train and hotels are all air conditioned but when you get out of them you face the reality of this harsh weather that I have been recently viewing in news channels. The worst part is that it is humid and there are heat waves. I also found Delhi to be terribly dirty and as I travel to other indian cities, I realise how clean and tidy Bangalore is. Though Bangalore is not comparable with other foreign countries, it is far better than any other Indian cities. I think the cleanliness is limited to Bangalore, Mysore, Coorg, South/North Canara and Kerala. My train was on time and I was more than happy to get into an AC compartment. I had a bad headache so I dozed off for a while. 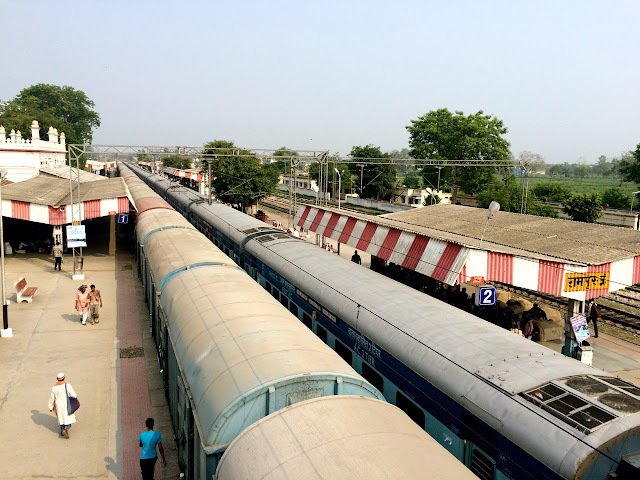 The journey from Delhi to Rampur is about 4.5 hours long and it passes through lush fields of UP. I reached Rampur at around 4PM. It was interesting to notice the TT chase some locals who were traveling in the small pockets between two bogies. Here, I was to take a bus to Milak. I had never spoken to Aman about this travel before so I was kind of clueless of where I was heading and how I would reach his house. So, this made it a very adventurous experience. I only wished that I had a backpack and I was on a never ending road trip. Rampur seemed like a crowded small town. I took a tuk tuk till the bus stand which is actually not very far but I was advised so by Aman considering the luggage. 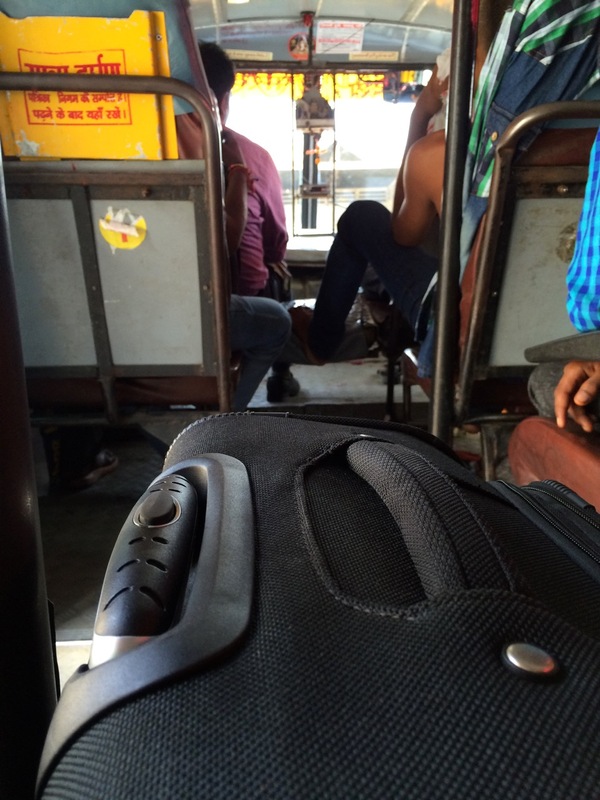 He had told me that the fare would be around Rs10 but the driver demanded Rs20. I agreed without hesitation and he seemed startled. He repeated the fare and I agreed again. He appeared guilty of his own act and perhaps thus began a conversation enquiring which train I had taken etc. For the extra money I had paid, he parked the vehicle next to the bus driver and checked for me, the his destination. Surprisingly, I found people in Delhi and this part of UP very polite. I never saw people quarrel and speak harshly. Even bus conductors maintained humility. And the language, I found to be very melodious and polite Hindi language spoken here is perhaps in its purest form, just like I had studied and spoken in School. The bus driver played old Hindi film songs sung by Kishore Kumar, Mukesh and Rafi. In the front mirror, I could see the reflection of his face as he pinched his eyebrows, swayed his head and slipped into an emotional expression while following the romantic tune of the song. Just by the enternace was a notice put up by a family desperately in search of their teenage daughter. Written in Hindi was a request to her to return home considering the health of her sick mother. She was informed of how her sisters and brother are in bad condition due to continuous crying. They also agreed to surrender themselves to all her conditions and agree to her decisions. Anybody informing them of her whereabouts were also assured an appropriate reward. The notice seemed a little weird to me. I had seen publications for missing people but this was more of a willing disappearance. The bus journey was short, for about 25 minutes. Milak is a small town on the way to Bareilly from Rampur. At Milak, Aman’s dad came to pick me. I was happy to meet Aman and his family. Aman’s grandmother welcomed me with a warm hug and a kiss. Aman’s mother offered me some delicious ghee rice, Rajma curry and kheer. His cousins and uncle politely greeted me. I realised that this was going to be an exciting experience!